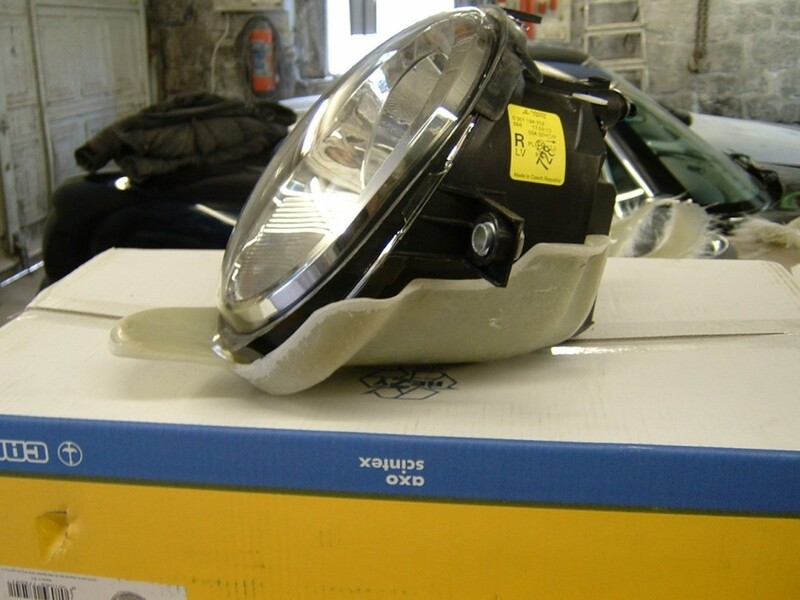 This guide explains the process of cutting open the headlamp aperture, fitting custom-made support cradles to the Lupo's, and positioning them into the Chimaera's headlamp recess, before tailoring the matt black half-cowl pieces to shape, and finally fitting the faired-in covers over the top. 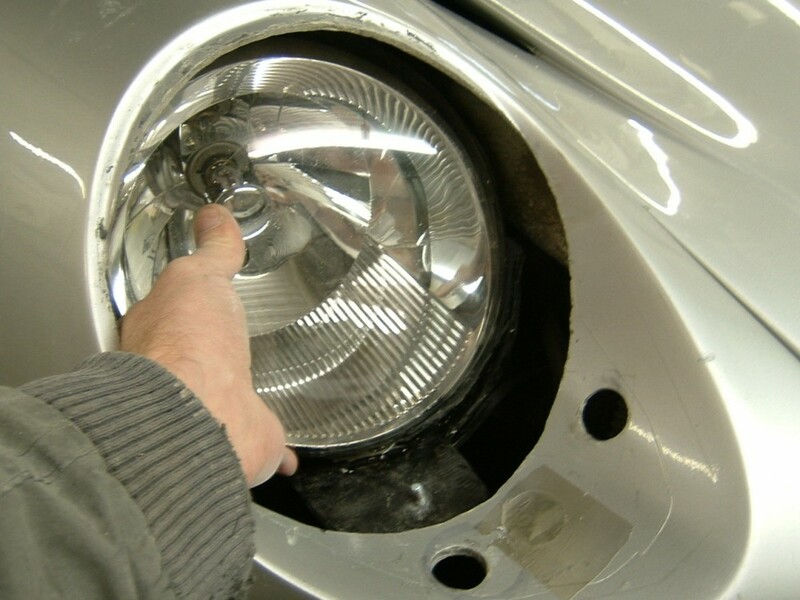 Before starting the job, ensure that you're happy with the existing headlamp adjustment, that it doesn't dazzle other motorists and is adjusted correctly for the car (MOT passable). 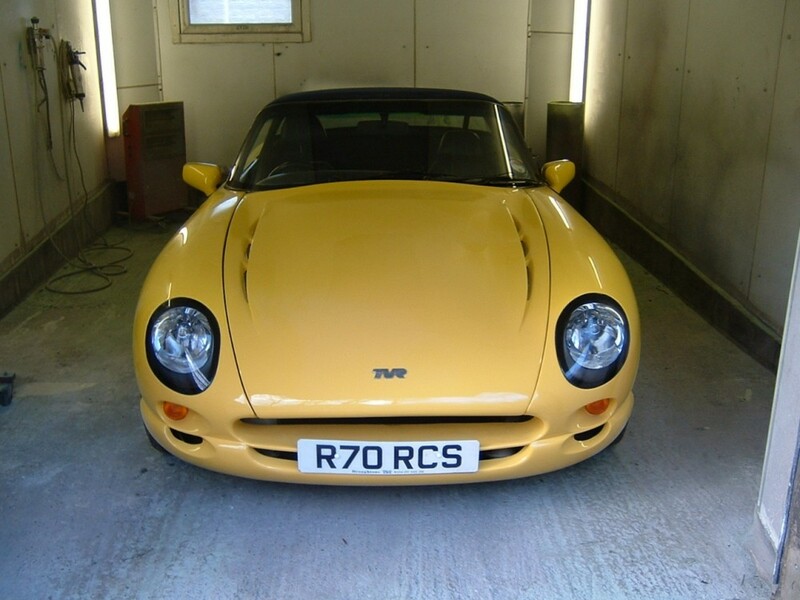 The first job is to park the car in a convenient place for working, ideally in a level garage facing a flat level wall. Jack the car up and support it safely on axle stands at a convenient height for working. 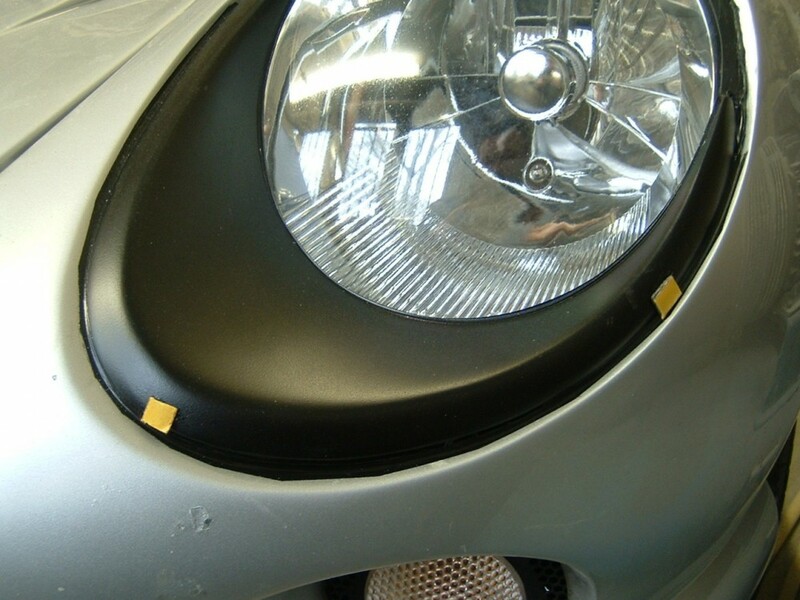 Switch the headlights on and using masking tape, or felt markers, etc, mark the noticeable areas of the beam pattern from the existing headlamp adjustment on the wall - mark the beam alignment, the 'hot spot' which indicates the centre of the beam. You should have an access cover in each front wheel arch just behind the headlamp area. Remove the covers which will be held in place by self tapping screws (usually Philps) and sealant. 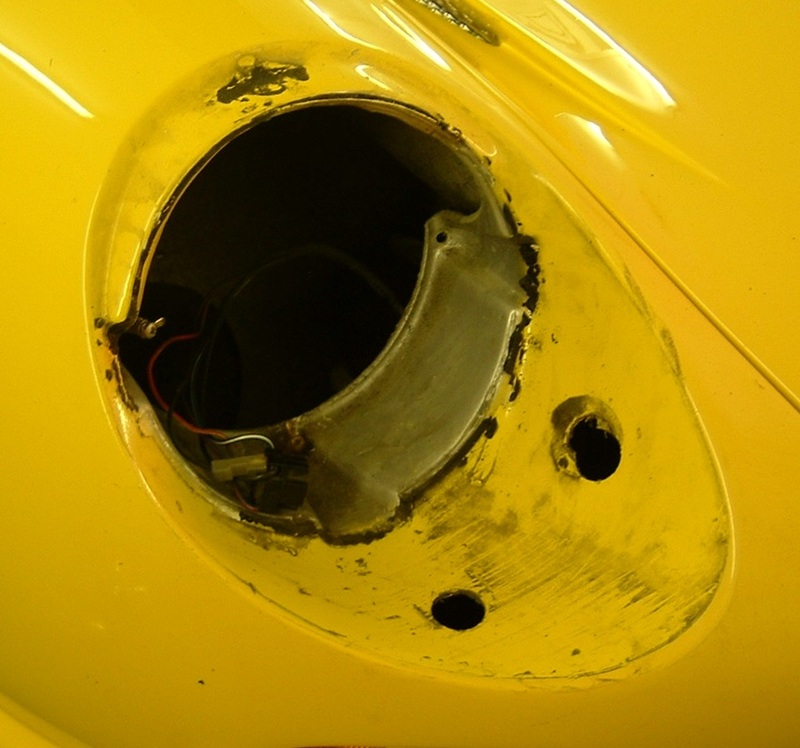 Now remove the plastic painted headlamp cowl which will be secured from underneath with a pair of wing nuts on each cowl. These will probably be a little rusty but don't be too concerned with their condition as they wont be used again after the conversion. 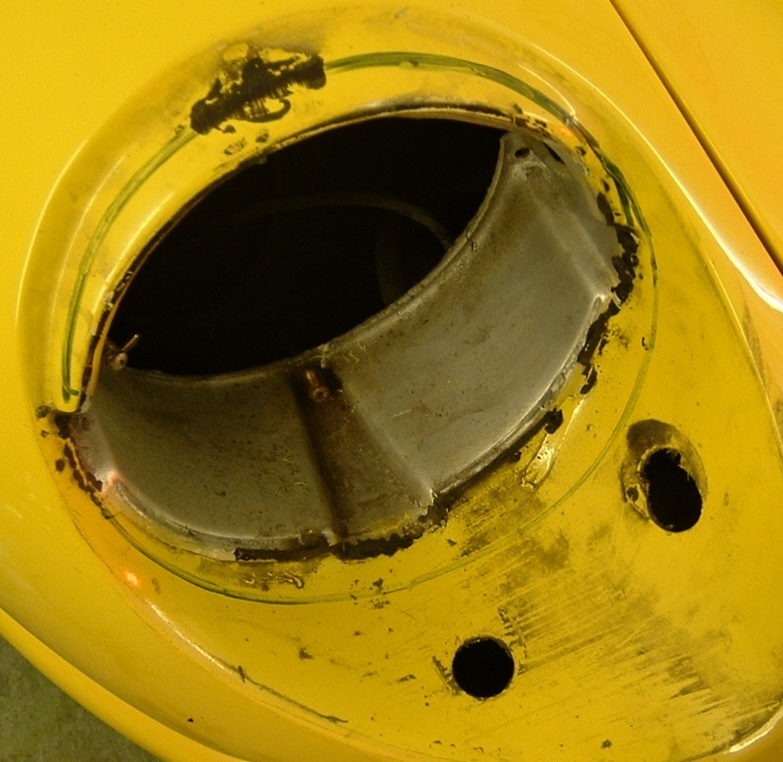 Sometimes the thread section will break away from the plastic cowl and be left bolted in place in the bodywork, in which case you'll just need to hack saw it off after the cowl comes away. There will also be a blob of sealant holding the top rear edge of the cowl to the bodywork - this will just prise away carefully. 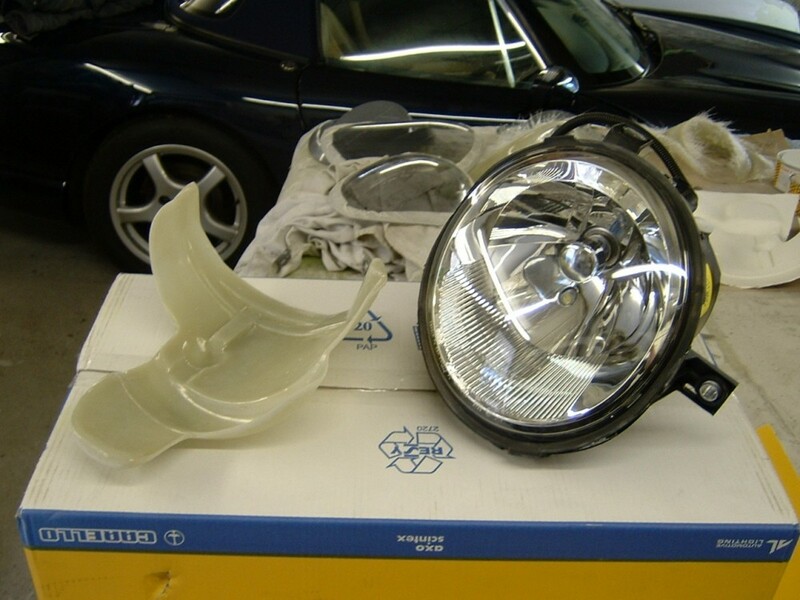 Next, cut out the glass headlamp bowl which is just secured in position with sealant. 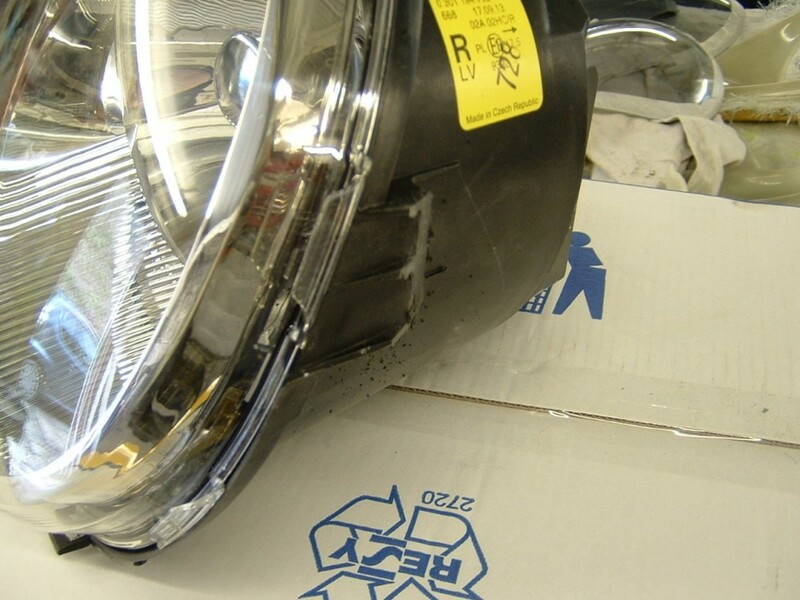 Remove the chrome reflector and adjusting screws. Again, these will probably be corroded so cut them out if they are stubborn. Here the specially made templates are being used to mark the suggested cut line. These templates are for our own workshop use, however, they can be loaned to DIY customers on the basis that they are returned immediately after use. These are the only templates that exist - there is no spare set, so a charge will be made if they are lost or damaged. Although they are not strictly necessary, they do save time and reduce trial and error cutting. Alternatively, instead of using these templates, these pictures can be used as a giude to determine the amount of the aperture to cut away. The cut line provided by the template is clearly shown here. Even using the templates, there may be some further tweaking needed to the opening to allow the Lupo unit, complete with the cradle fitted, to pass through and be orientated into position. The opening is cut out to the required line. This needs to be done carefully, either with an air saw, jigsaw, or Dremmel-type tool, or by first drilling a hole to get started and using a saw blade. A cutting disc on a grinder is a good way to remove the bulk of the work and finished off with a Dremmel to neaten the hole. Be careful of fibreglass dust. 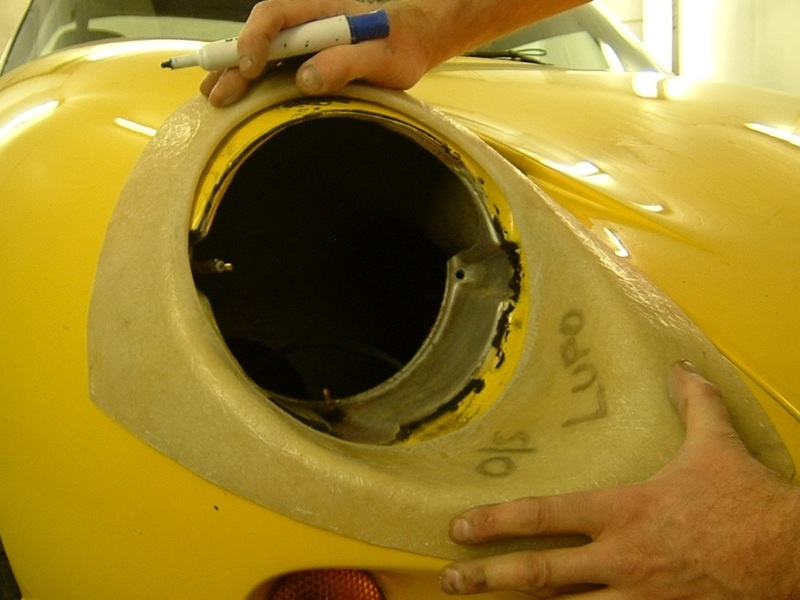 The fibreglass in some places may be very thick and needs grinding back to a overall thickness of 2-3mm to allow the Lupo unit to sit in the aperture. 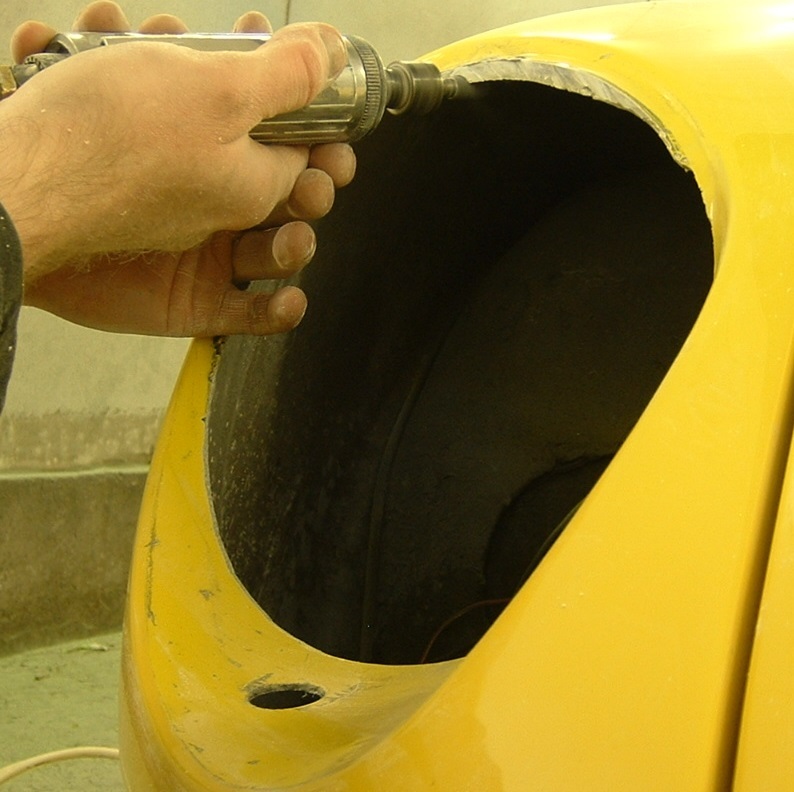 Grind away any excess thickness of fibreglass from the edge to get the Lupo unit sitting nicely. Picture 4 also shows this thickness being ground away using a Dremmel. 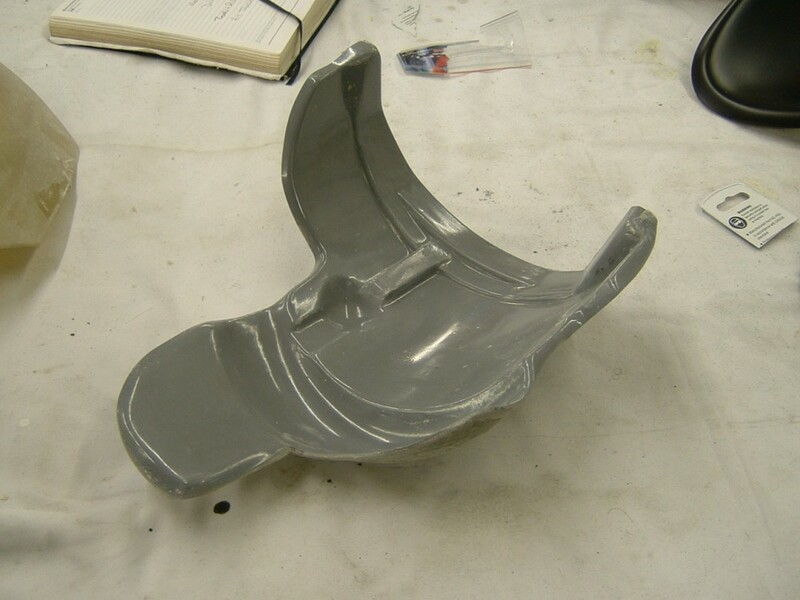 IMPORTANT - the cradles are designed to fit genuine VW parts, NOT cheap aftermarket items. The fibreglass support cradle sits underneath the Lupo light unit and can either be screwed or rivetted together. 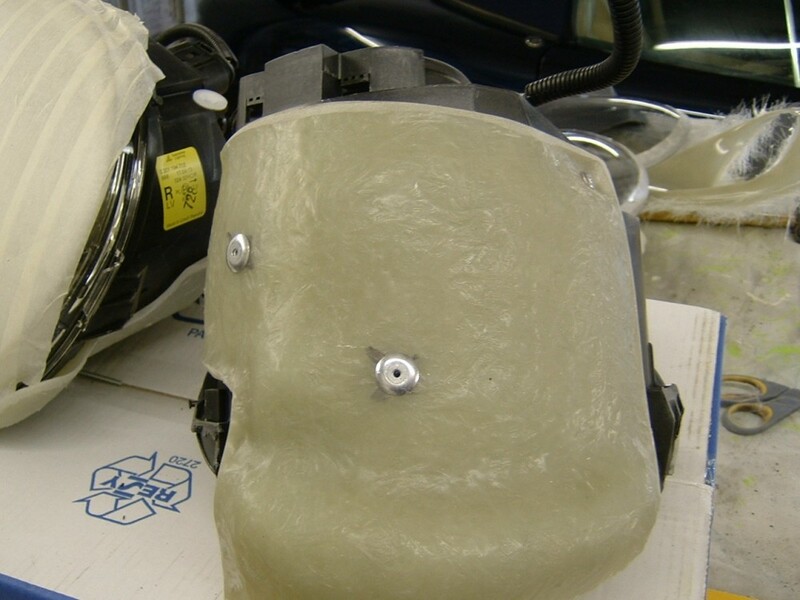 The front 'chin' of the cradle protrudes forward and allows the cradle to have a single mounting bolt positioned into it via one of the existing holes in the body used to mount the original plastic headlamp shroud. 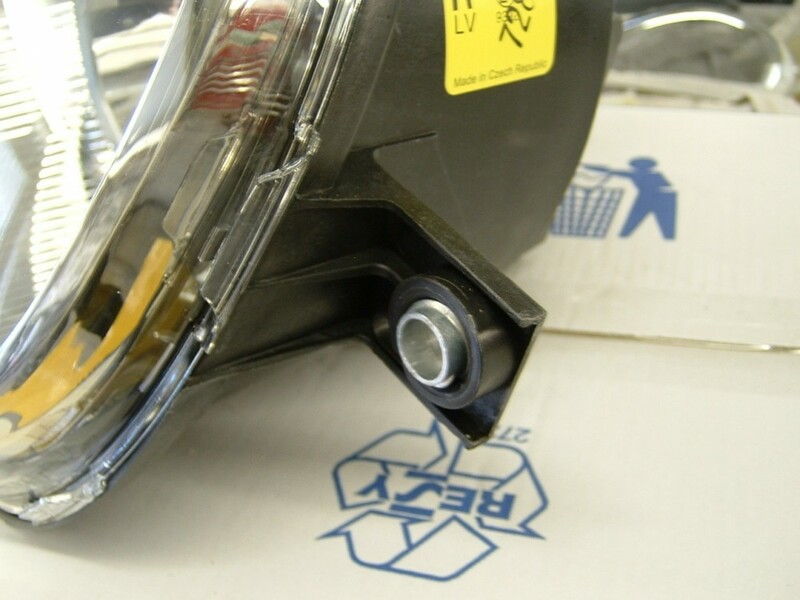 Cut off all the mounting lugs from the Lupo units, and also remove the rubber surround from around the lens. Drill and screw/rivet the cradles to the Lupo units. 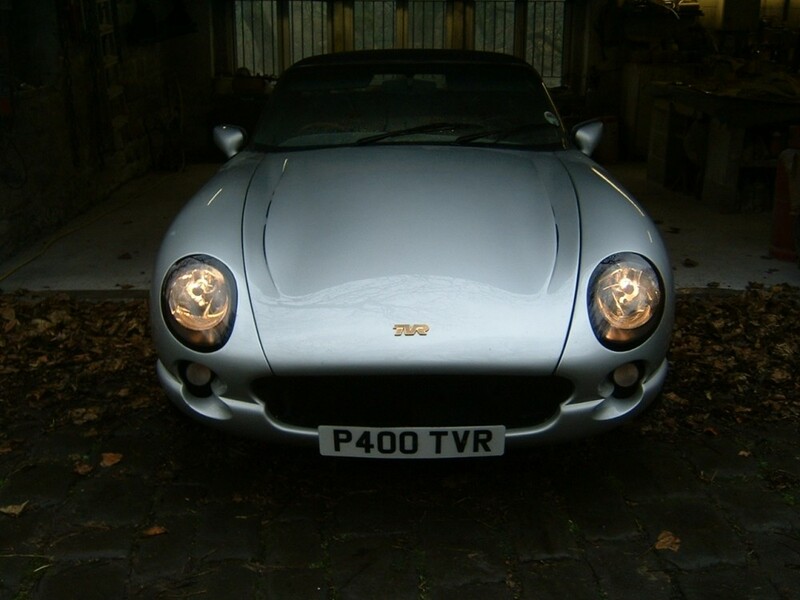 Make sure the side-to-side adjustment on the Lupo's is wound outwards to each side - this is where the slight compromise of fitting Lupo's to a TVR shows up. The Lupo alignment is designed for its fitment in the VW, when fitted to a TVR the Lupo's are out of line slightly and this needs to be compensated for with the manual adjusters. The beam may need directing downwards slightly too. You'll also be able to play about with the beam alignment and gain some further adjustment to the beam direction by twisting the Lupo unit within the opening - just move it in a slightly different position and re-drill the mounting bolt in the cradle at the front. Keep periodically test fitting the Lupo in place - with the cradle attached, to see how it sits in the hole. The Lupo will pass through the bodywork hole by offering it up to the hole pointing straight ahead as it would be if fitted, and then rotating it 90 degrees (so its on its side) then it will pass through, and can then be rotated upright again and tested in the opening. 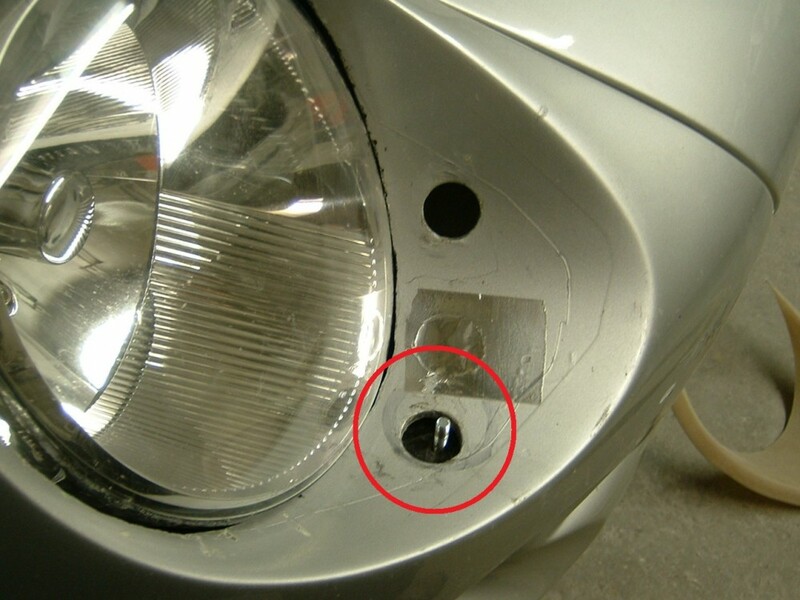 Make sure the front flange of the cradle is visible through the lower mounting hole in the bodywork when deciding where the Lupo should be positioned. Temporarily connect the wiring and see how the beam looks. Drill as many test holes as needed through the flange on the cradle and bolt it in place. Keep test fitting like this, and making as many adjustments as needed to get the Lupo alignment good. There will be a fair bit of trial and error at this stage but be patient and you'll get the alignment in a good place. Expand the picture to see the exact description. Expand the picture to see the detailed description. 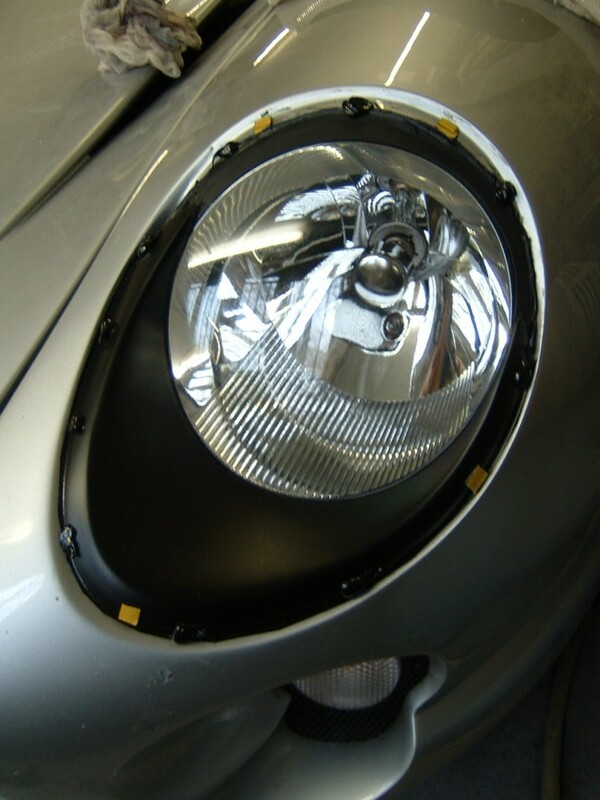 The cowls supplied for fitting with Lupo's start out as standard cowls - as used to go over the standard headlamps, however, they will need cutting to shape to match up to the Lupo lens. The green tape line in this picture gives an idea of the amount that needs cutting away. Only the lower / front portion of the cowl is needed, the top half is discarded. 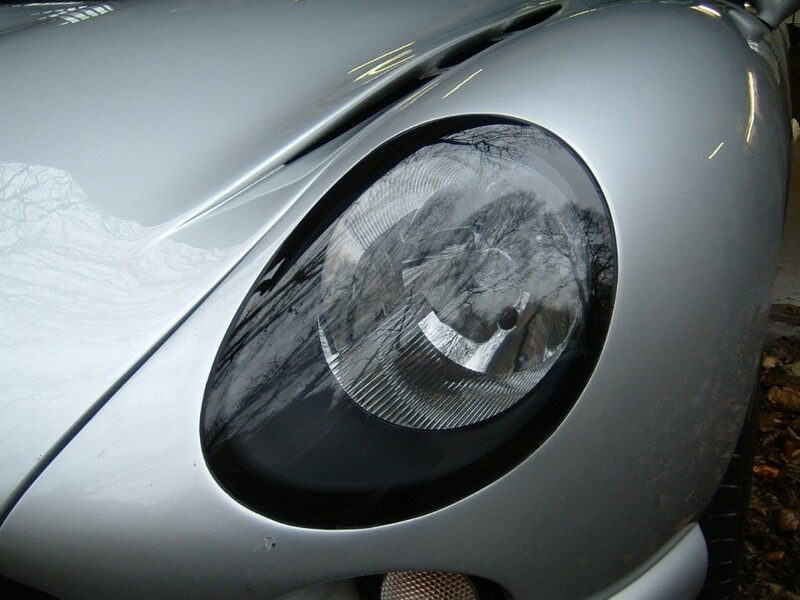 As well as being cut down to size, the shape of the cowl opening will need widening at each side to more follow the oval shape of the Lupo lens compared to the circular original lights. Due to the cutting and trimming needed, these cowls would usually be supplied in bare gelcoat to be sprayed matt black afterwards by the customer. Any matt cellulose or satin aerosol paint would be fine for this. Expand picture to see detailed instructions. Picture 18 shows the matt black cowls being fitted, either using filler, or black sealant. Filler is preferable if possible because it sets hard after around 15-20 minutes and then the remaining fitting stages can continue. 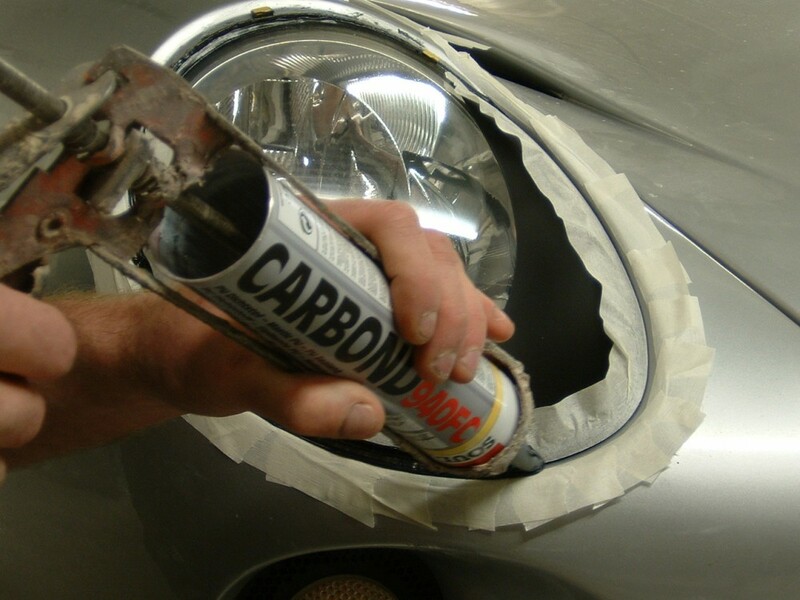 If using the black sealant then allow an overnight cure before moving onto the next stages. In both cases, whether using filler or black sealant, make sure that the exposed mounting thread, washer, and wing nut are fully covered to prevent it from winding loose. Picture 19 shows the matt black cowl sat in place (on top of quick-drying filler in this example) and in its correct position. Make sure its not sitting to far forwards, or off to one side that it would push the faired-in cover away from the bodywork. 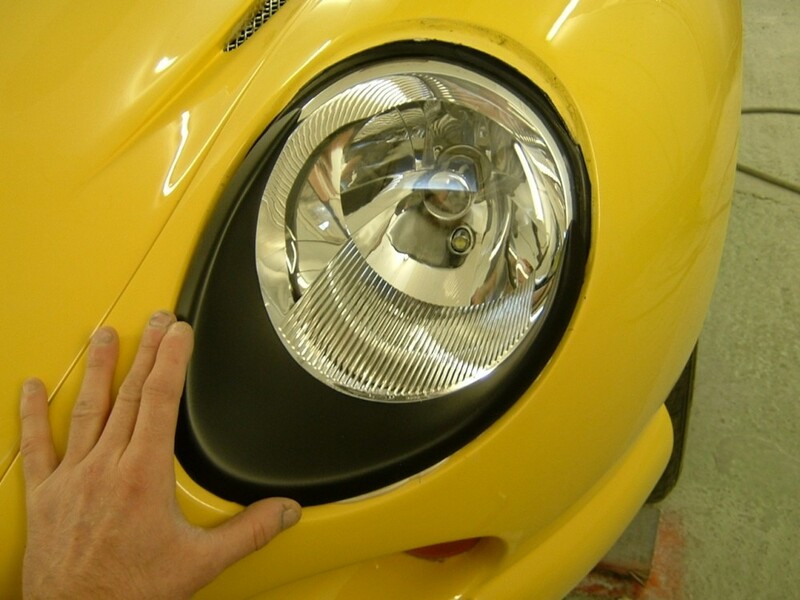 Make sure the positioning of this matt black cowl allows the faired-in cover to sit flush to the bodywork. 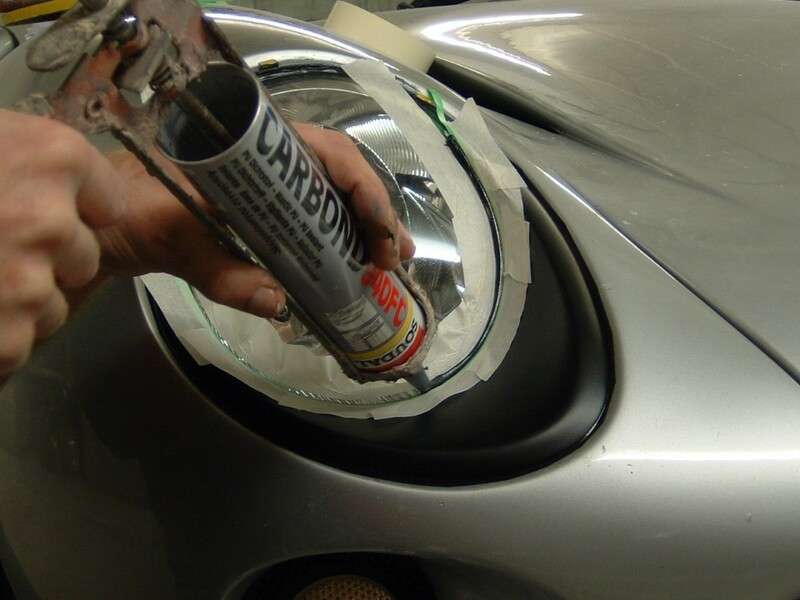 Wipe away any stray sealant or filler that oozes out before it dries. 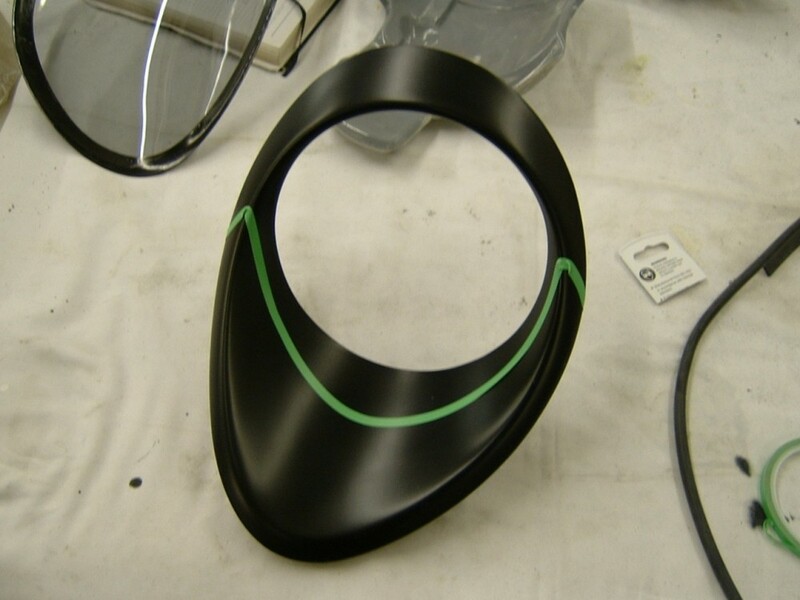 The following pictures show the matt black cowl being sealed around its edges. It is vital that the top corners are not fully sealed - the two sealant beads must not join up together - a small gap separating the sealant beads will allow vital airflow inside the pod and prevent trapped moisture condensing on the inside of the faired-in cover. Leave this sealant to cure overnight. Expand picture to see exact description. Expand picture for full details. 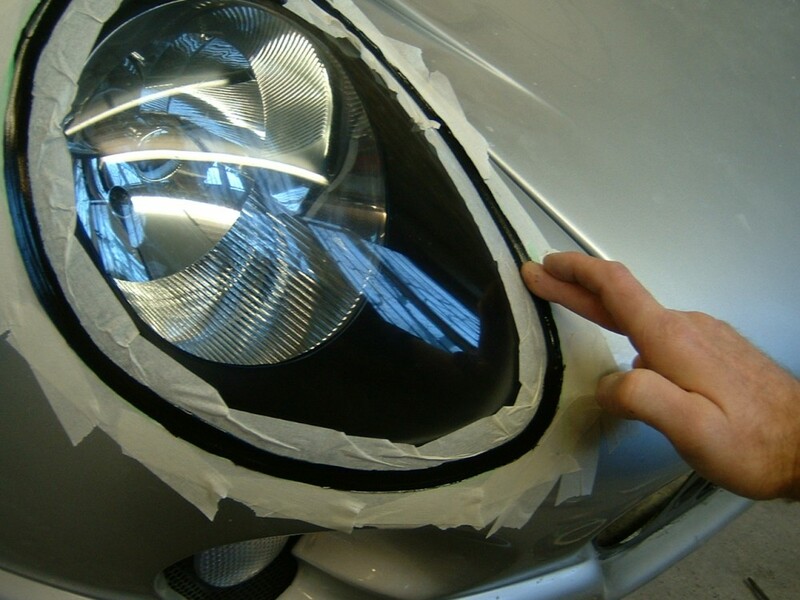 Here, the matt black half-cowl section is being neatly sealed to the Lupo lens, and to the body. The final stages involve getting the faired-in lens sitting nice and flush to the bodywork - using small packing's if necessary in certain places around the circumference (these packing's will be hidden out of view behind the black border of the faired-in cover), and then setting the lens in position using a few blobs of sealant at intervals around the edge. Use as many small packing's as necessary - small rubber pieces are supplied in the kit and can be superglued on top of each other to get the required height. Get all the packing's in place, and test fit the faired-in cover to make sure it sits flush BEFORE using any sealant. 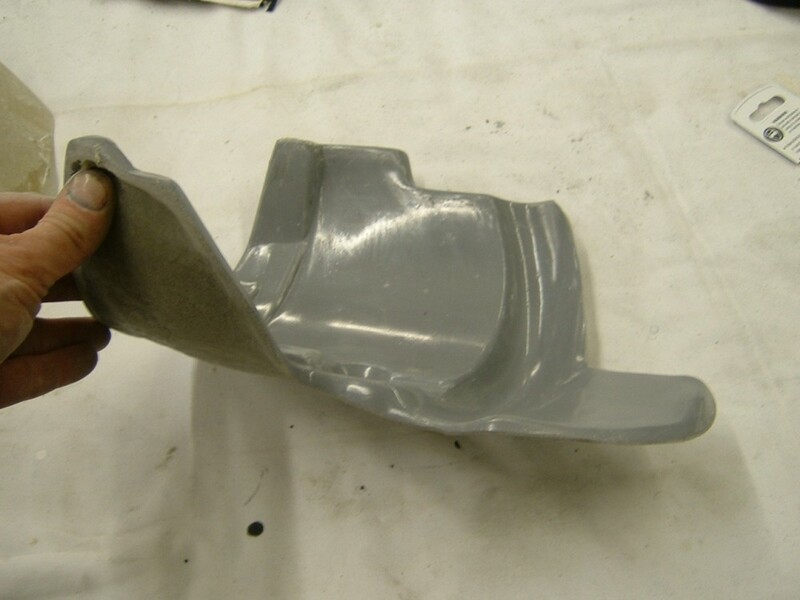 The faired-in cover is quite flexible and may need to be manipulated slightly - by using packing's to prevent it from sitting low in some places - the plastic is very durable and can easily flex enough to allow it to sit flush to the body. Don't be afraid to use packing's where needed and then tape the faired-in cover down firmly to the bodywork to hold it into a nice flush position. Make sure the matt black cowl, and the inside surface of the faired-in cover are clean and free from dirt, dust, smears, etc, before sealing in place. Only blobs of sealant are needed at this stage to bond the faired-in cover into position. The blobs of sealant will hold the faired-in cover in position whilst the sealant cures overnight. Don't try fully sealing the circumference with a continuous bead at this stage. Make sure the faired-in cover is taped down firmly in its final seated position - flush with the surrounding bodywork, resting on the packing's and blobs of sealant, and leave to cure overnight. 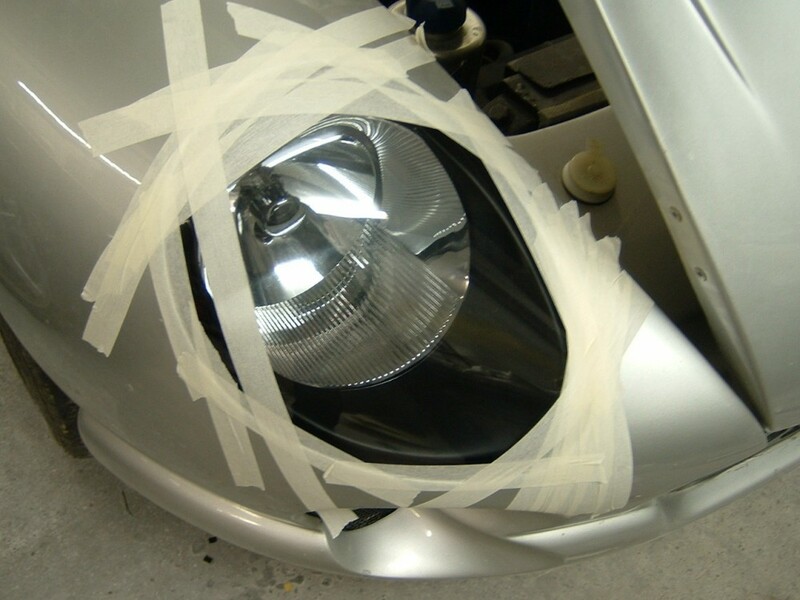 Use as much tape as necessary to keep the lens in position and avoid it shifting on the wet sealant. 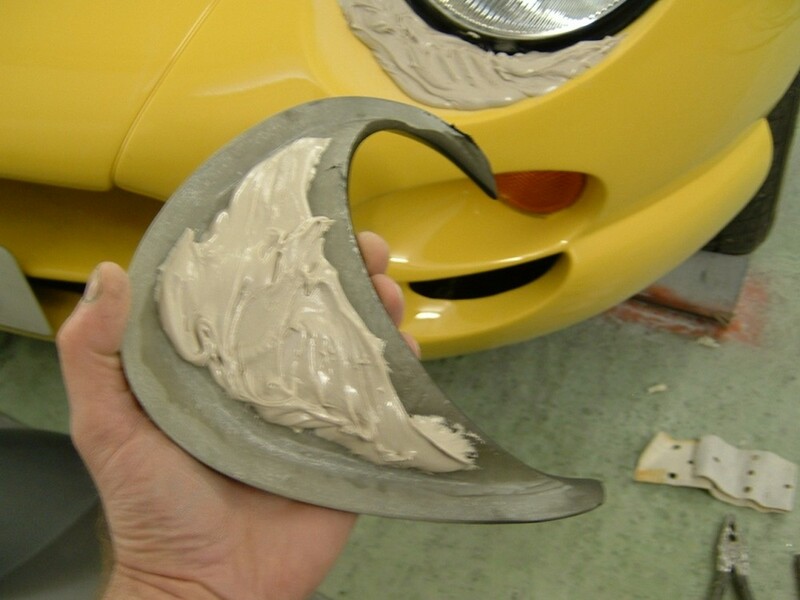 After an overnight cure, the outer circumference can be neatly masked out and sealed with sealant. Make sure this sealant is a full, neat, continuous, unbroken bead around the circumference. This provides 100% of the weatherproofing. Any gaps in this final sealant bead will allow rainwater to enter the pod.